A feature-packed package for both PC and Pocket PC. 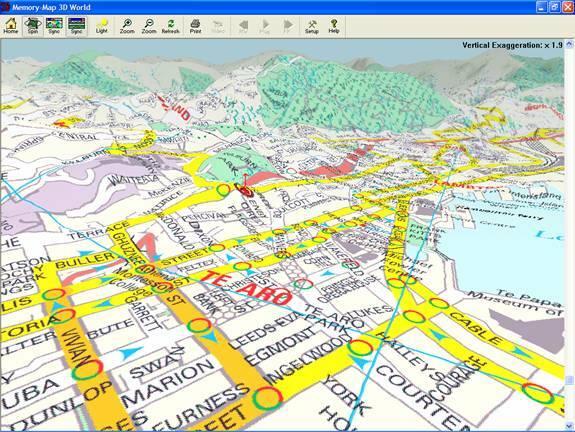 Easy interchange of map, GPS, and other data between PC and Pocket PC, and integration with most GPS devices. Easy route planning and impressive track analysis. Quick map loading and scrolling. Great 3D viewing and fly-throughs of any of the maps. Not true “navigation” software for driving. Satellite layer not very detailed. No easy way to turn GPS device on/off. No way to slow down the fly-throughs. Proprietary map format. Currently no other maps available, and cannot create your own map layers.